This is a patient of ours. He is 37 years old and was unhappy with his smile. We talked about his options: Teeth Whitening, Invisalign or Veneers. The patient decided that Invisalign was out of the question since he didn’t want to wear the retainers all of the time. We mapped out a treatment plan which included Teeth Whitening and Veneers, and created a waxup of his projected outcome. In the meantime, he sat through a chairside whitening procedure. This process is done at the office while patients watch Netflix. The gel is applied a couple of times over the course of an hour or so. Once he was satisfied with the color of his teeth, we prepared the enamel for porcelain veneers. In the meantime, while we were waiting for the technician to create his veneers, he was wearing a temporary acrylic version of the veneers. The veneers came back to the office about two weeks later and we sat together to try in the final product. During this visit, we are super picky. I really want the patient to be happy with the final outcome of his teeth whitening and veneers. It is no problem (and very common) to sit for awhile to talk about how the teeth look. In this particular case we wanted to make slight changes to the esthetics. 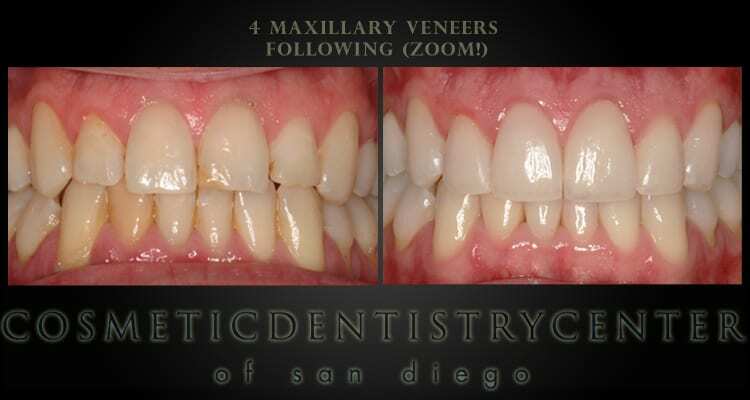 The veneers were returned to the lab and we cemented them in permanently 3 days later. We make the recommendation that patients wear a night guard once the veneers are in place in order to protect the porcelain from bad dreams. The patient was happy at the end.